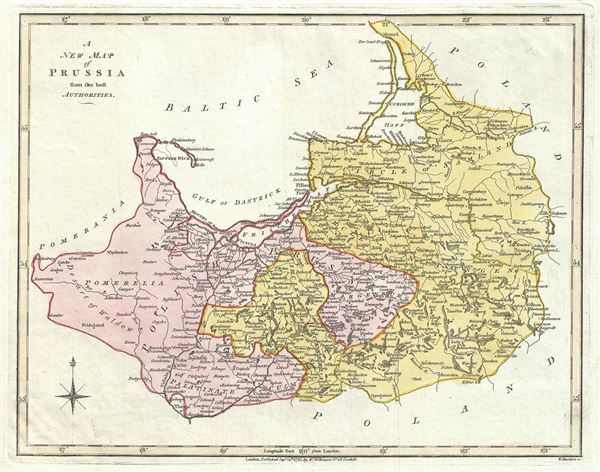 This is a finely detailed 1793 map of Prussia, by Robert Wilkinson. It covers from the Baltic Sea south as far as Torun (Thorn), and depicts the Holy Roman Empire Circles of Hockkerland, Samland, Natangen, the Palatinate of Culm, Pomeralia, and Polish Prussia. The map offers extraordinary detail, noting numerous towns, cities, rivers, forests, mountains and other topographical features. The 'circles' are the 'imperial circles,' administrative units created for tax and defense purposes by the Holy Roman Empire, of which these areas were a part. The Napoleonic Wars would, of course, dissolve the Holy Roman Empire. This map was engraved by Thomas Conder and issued as plate no. 8 in the 1792 edition of Robert Wilkinson's General Atlas.